What’s in the New Australia-Singapore Military Exercise? A look at the significance of a new interaction within their broader defense relationship. Last week, Australia and Singapore kicked off a new military exercise between them. While the interaction is just one of many between the two comprehensive strategic partners, it nonetheless deserves attention within the recent gains seen in the broader Australia-Singapore defense relationship over the past few years. As I observed previously in these pages, Australia and Singapore have long had a strong defense relationship as part of their wider ties, which were elevated to a comprehensive strategic partnership in 2013. Beyond the usual components of defense ties such as intelligence sharing and exercises, both countries are longstanding members of the Five Power Defense Arrangements (FPDA), Australia is among the key places where the land-starved Singapore military has conducted overseas training, and the two militaries have also had joint operational deployments in countries such as East Timor, Iraq, and Afghanistan. Over the past few years, the relationship has deepened still further. Notable developments have included not just the expansion of Singapore military facilities in Australia, but also other significant developments within defense ties such as the upgrading of existing military exercises and exchanges and the launch of a new dialogue on regional and security issues (see: “The Enduring Strategic Logic of the New Australia-Singapore Military Training Deal”). In recent days, we have seen yet another notable development along these lines within the defense aspect of the relationship with the holding of a new exercise between the two countries. The Singapore Army and the Australian Army held the inaugural version of the new Exercise Crescent Star from October 24 to October 29 in Singapore. According to Singapore’s defense ministry (MINDEF), the inaugural iteration of Exercise Crescent Star involved 220 exercise participants from the Singapore Armed Force (SAF)’s Army Deployment Force and the Australian Defense Force (ADF)’s Rifle Company Butterworth. 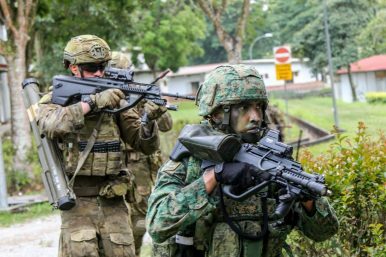 Per MINDEF, the exercise itself included joint small arms live-firing at Nee Soon Range using assault rifles and an integrated company maneuver exercise at the Murai Urban Training Facility, where exercise troops jointly launched an assault to capture an urban objective. The exercise participants also shared their tactics, techniques and procedures for Close Quarters Battle with each other to enhance interoperability between both armies. No details were offered on exactly when the next iteration of Exercise Crescent Star will be held. But as we see more specifics around that, those will be important to keep in mind to assess how the new interaction is evolving within the broader Australia-Singapore relationship. The domestic difficulties of operationalizing an agreement should not detract from its clear strategic logic. Joint Ministerial Meeting Puts Australia-Singapore Defense Ties in FocusDefense Chief Introductory Visit Puts Singapore-Australia Security Ties in FocusSingapore-New Zealand Defense Ties in Focus With Military ExerciseAustralia-Singapore Military Ties in Focus With Navy Chief VoyageWhy is Singapore Eying a Military Base Deal With New Zealand?